It's the end of THE WEEK for New York's fashion set, but most other people have one more day before they can take a breather. Whether you're in the former or the latter group your feet could probably use a break, and if you're in the New York area there's a strong chance of showers in your area tonight. As a result, you'll want to wear shoes that are comfortable, stylish and at least a little practical, but a pop of the unexpected is also a requirement for you. These Loop pumps by Melissa (available for $180 via Karmaloop.com) are everything you need. They're eco-friendly rubber, so they won't be ruined in the rain, and the bright blue color is impossible to look at without smiling. 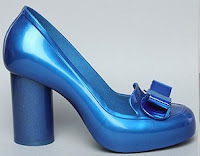 Plus, the chunky round 3.5 inch heel adds extra whimsy and the bow on the front is feminine and fun. It doesn't hurt that their loafer styling is spot on with this season's school-inspired trend. The end of Fashion Week is always bittersweet for fashion hags like you. 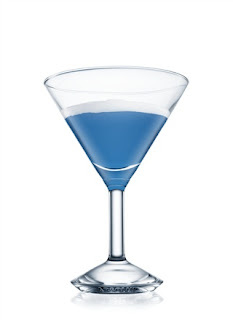 Let your cocktail express your mood, and drink a "Blue Day" this evening. Yes, you'll get free drinks at one open bar or the other tonight, but you HAVE to drink something with you dinner. It's a simple mixture of Absolut Vodka and blue Curacao, so it'll be pretty sweet and plenty strong.